Thanks to Simon's gentle persuasion, I bought a set tonight and hopped on before I had the chance to get nervous and chicken out. 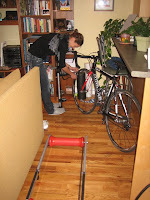 Yes, I am a little embarrassed to admit that since starting the sport years ago, I have never tried rollers, always opting for the trainer. I was actually really excited to pick them up, feeling as though I had this great new toy. They were immediately taken out of the box once I got home and I was ready to ride. I was VERY shaky at first and wouldn't let go of the couch (or the countertop....or both...) for quite some time. It also didn't help that I FLATTED while on there! (I think it's time to get new trainer tires!) Once I worked up the courage to let go, I was surprised how quickly I got the hang of it. Within a few minutes the TV was on and I was more or less comfortable. Hi Lauren, I've got a trainer but never used rollers. What's the difference? On a roller you're bike is not attached to a fixed object (i.e. the trainer) so you must rely on your bike handling skills much more than you would on a trainer because the bike can sway from side to side. In this way, being on a roller simulates what is is like to ride on the road. edit- "you're" for "your" in first sentence. Thanks, anonymous, for answering the question! 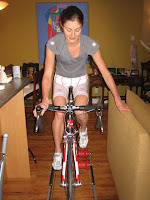 From what I understand, rollers are also great for creating an efficient pedal stroke, as well as improving your balance by engaging all your little stabilizing muscles (core) while riding. 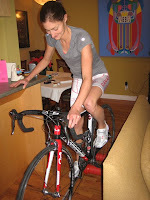 I won't do all my indoor rides on the rollers, just recovery or easier rides. I will stick to the trainer for the efforts. Wow - good for you for conquering your fear....I too just conquered my fear and used my clip pedals outside. It wasn't so bad either. Good for you Lauren! I find that when I step out of my comfort zone, I usually make great improvements. No doubt this was a good move for you!